Odessa is a gaff-rigged L.F. Herreshoff-designed Buzzards Bay 14 (17′ LOA, 3-foot draft, 5′10″ beam) sloop launched June 8 at Clark Boat Yard in Jamestown, Rhode Island. The hull for “Odessa” was built by Graves Yacht Yard, Marblehead, Mass. in 1984 and is cedar planking on white oak frames and backbone with a varnished mahogany transom. 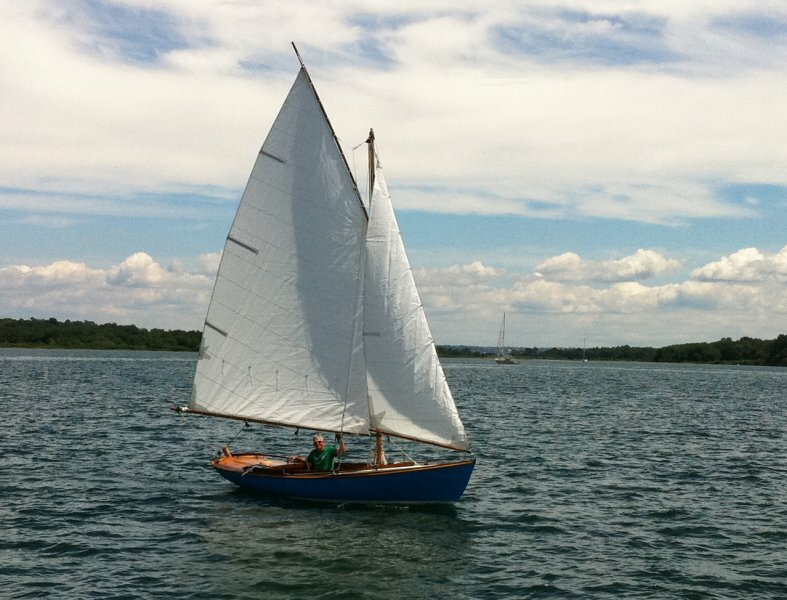 She was finished by Paul Rollins in York, Maine for her original owner, also in 1984, and features spruce spars, mahogany coamings and trim, and a laid cedar deck. Mick Cochran bought the boat in the fall of 2010, did some minor renovations and repairs to her cockpit and after deck, installed new Nat Wilson (East Boothbay, Maine) sails and is now happily sailing “Odessa” in and around her home base of Dutch Harbor at the mouth of Narragansett Bay.